Manufacturing facilities can be complex areas. For safety, security, and efficiency, it is essential that everyone who uses or visits the facility knows where they need to be. 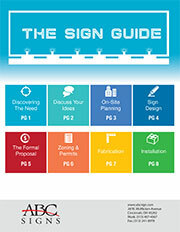 Manufacturing signs are an effective way to achieve these goals. Manufacturing signs can be used in a number of ways, beyond the company’s primary identifying signage. Manufacturing signs located outdoors may be used to indicate a visitor entrance, employee parking, or a route for shipping deliveries. Inside a facility, manufacturing signs are used to identify departments, designate restricted areas, and to identify areas that require safety apparel, such as steel-toed shoes or safety glasses. Manufacturing signs can also be used to provide notification of procedures and operations. Manufacturing signs are excellent for communicating positive or motivational messaging to employees. In the case of manufacturing facilities that conduct tours for business associates, exciting and eye-catching signs can be used to promote new products and services on site. Whatever your manufacturing sign needs are, we can help. Contact us to discuss your signage needs!